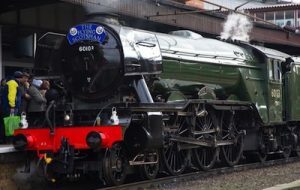 First Class Partnerships congratulates the Science Museum Group (SMG) and the National Railway Museum (NRM) on the restoration of the Flying Scotsman and the successful inaugural run of this most iconic locomotive on 25 February 2016. We have been delighted to be deeply involved in the restoration project for the past 3.5 years, undertaking in mid-2012 an in-depth investigation and review of the engineering condition of Flying Scotsman to establish what restoration works were needed to enable it to return to service in a fit for purpose state which would achieve normally acceptable levels of operational reliability. Our consultancy team of Tony Roche, Allan Baker and Michael Corbett, all Chartered Mechanical Engineers, has exercised their extensive professional engineering knowledge of railway rolling stock, together in excess of 120 years, to provide NRM with appropriate levels of technical and project management competency. – Completed a full professional engineering examination of Flying Scotsman, utilizing their knowledge and experience of railway rolling stock overhaul requirements, particularly as applied to steam locomotives and using the technical competence related to their Chartered Mechanical Engineering status. – From that review, produced a comprehensive and detailed submission of our findings with recommendations on the way the restoration project is taken forward and additionally provided important proposals regarding the future maintenance requirements and operational constraints to be applied upon its return to service to give the locomotive ongoing reliability. – Supported the NRM in identifying potential contractors to do the restoration; provided independent engineering and commercial evaluation of the bids, including an internal proposal from the NRM workshop group. – Gave an extensive presentation of the findings and recommendations of our report to the SMG Board, which Board Members have advised was pivotal in them approving the restoration to proceed. – Undertook a high level engineering advisor role on behalf of SMG/NRM to monitor and oversee the restoration programme to confirm that methods and processes applied by the contractors workshop staff were in conformance with laid down standards – some of the work particularly on the locomotive side-frames and the OTMR system required engineering design and application that were first time applications on steam locomotives. – Provided a senior project and programme manager to monitor and control the physical and financial progress of the restoration works, working with NRM and the chosen contractor. It is extremely rewarding to now see the results of the cooperative effort between FCP, the construction contractor and SMG/NRM in bringing Flying Scotsman, back into service after 10 years of restoration works.